Scrappy Mel: Terrific Tuesday Challenge - Tag it! Terrific Tuesday Challenge - Tag it! I made these tags for the Secret Santa exchange that we are having at my work. We are doing 3 small gifts and one large gift for the week before Christmas break (I work at a school and we are only there Mon-Thurs). I left the last tag blank under the "From" so we can write our names on the final day for the reveal. 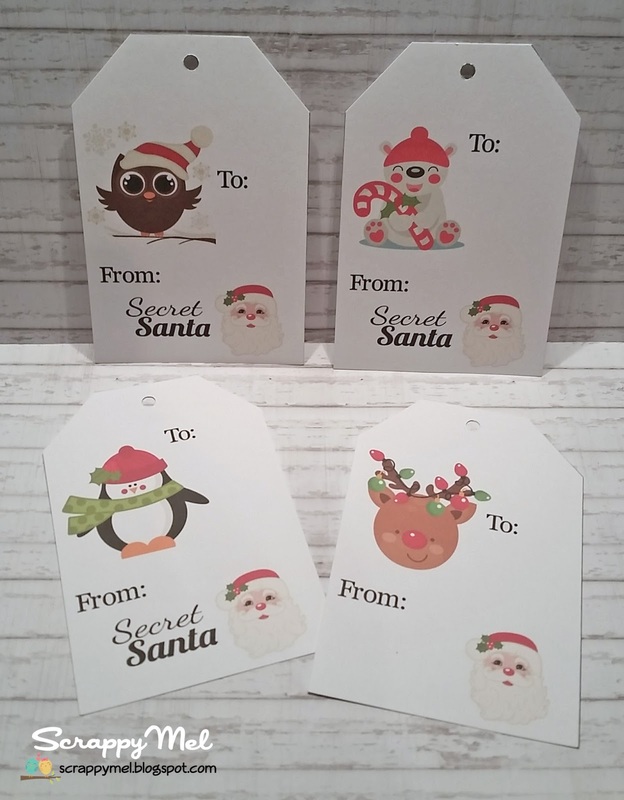 The images are all from Miss Kate Cuttables, the "To" and "From" are on SMS Happy Mail stamp set, and the "Secret Santa" stamp is from SMS Christmas Cheer set. I hope you enjoyed my project and that you will come link up your tag project for a chance to win a Scrappy Moms Stamps set of your choice! Mel, These are so cute. I love the two images on them. Your tags are so adorable, love those sweet images! These will be so fun for your Secret Santa gift exchange! I love these tags. The images and sentiments look so good! Wonderful tags! They are adorable. Great job! Wonderful tags!The images and sentiments look so good! Thanks for sharing!! !